​A speedy start by the Junior camogie team set them on course for glory in the Leinster Colleges Junior B camogie championship final against Castlecomer community school in Graiguenamanagh on January 26th. Our girls playing with the wind in the first half, showed they meant business from the opening whistle. They crowded their opponents, never allowing them a second in tough conditions, and were full value for their comfortable victory. Scores were hard to come by in heavy conditions but the Coláiste Bríde girls put down a marker right away with flowing attacking play which was hugely effective. Siobhan Sinnott dropped a second minute ball into the Castlecomer goalmouth that the keeper collected but when she tried to clear, Leah Scallan blocked the ball into the net. A tight angle on the left couldn’t stop Siobhan Sinnott from making it 1.1 to no score a minute later, and soon Leah Scallan almost had a second goal only to be denied by a fine stop by the Castlecomer keeper. Siobhan Sinnott converted the resulting ’45, and Loren Doyle opened her account as the lead grew to six points after seven minutes. Orla Redmond popped over a tidy score in the 18th minute, but things got particularly better for Coláiste Bríde when Siobhan Sinnott’s long range dead ball proved too hot for the Castlecomer keeper to handle on the goal line and slipped into the net. Leading by 2.4 to nil at half time, the Coláiste Bríde girls anticipated a tough second half playing against the breeze. But when they second half resumed ten minutes later the rain had stopped and the breeze had died. Still in the 33rd minute, Castlecomer got the boost they needed when a loose ball in the goalmouth was swatted to the net after a long range shot from outfield. Castlecomer pointed a 40th minute free to put six points between the sides, but that’s as close as they got. Loren Doyle registered her second point to calm any potential nerves before they appeared. After Castlecomer pointed a ’45, Kellyanne Dempsey was taken down for a penalty and Siobhan Sinnott chose to tap it over with eleven minutes remaining. The score now stood at 2.6 to 1.2. From then on our girls rarely looked like conceding the goal their opponents desperately wanted. Siobhan Sinnott converted two more placed balls after fouls on Orla Redmond and Nadine Fortune as Coláiste Bríde held out with a final score of 2.8 to 1.3 to take the Leinster title and advance to an All Ireland Semi final on March 2nd. Unfortunately our girls were narrowly defeated by Sacred Heart Secondary School Clonakilty in the All Ireland Semi Final. This game was played in what was described as ‘a wind tunnel’ at St.Patrick’s Park. Conditions underfoot and overhead were wet and miserable, but the game went ahead due to a strict fixtures structure. Losing 1.2 to 0.2 at half time, the girls produced a superb second half performance to bring the game back to a point with a minute to go, but unfortunately our girls were unable to find the equaliser and our fate was sealed in injury time when Clonakilty notched another score from a placed ball. The full-time score of 1.4 to 0.5 was a very disappointing result for the Coláiste Bríde girls to accept especially after sixty minutes of them playing their hearts out. The determination and work rate shown by our girls on the day was tremendous and the unsatisfactory result wasn’t due to lack of effort and work rate. There is absolutely no doubt that this team is a team to watch in the future. We are already looking forward to next year’s competition. We are still uploading the information for this page so check back to see the success of the last ten years which includes another two All-Ireland titles in Camogie, a Leinster Camogie title and a Leinster football title. The school philosophy towards sport has always being positive. As the dictum states “mens sano in corpore sano” (a sound mind in a sound body). Playing and enjoying sport is the most important. Winning trophies is a bonus. Competing, winning or losing, develops both mind and body and is character building for life. In 1971 Colaíste Bríde became a full Secondary school when the doors of the new building first opened on the side of Vinegar Hill. Prior to that the Mercy School was a Secondary Top and it was there that camogie was introduced and the skills of the game were taught to the girls by Sr. Mary Critchley and Breda Mc Clean, (now Mrs. Mick Jacob of Oulart). The backbone of the first teams came from Enniscorthy’s St. Mary’s Camogie Club and so it is not surprising that the school won its first Leinster Junior title, the Purcell Cup, in 1971 and went on to win the Senior A Leinster title in 1972 beating old rivals Mountmellick. However they were defeated in the All Ireland Semi-Final by St. Louis, Kilkeel, Co. Clare. Back Row L to R - Bridget Higgins, Patricia Higgins, Geraldine Dempsey, Geraldine Duggan, Mary O’Connor, Philomena Harris, Mairead Darcy. Front Row L to R – Maria Franklin, Shelia O’Brien, Ann Spratt, Mgt Kelly (Capt) Dorothy Walsh and Anne Maher. Colaíste Bríde won their second Senior A Leinster title in 1974 but were beaten by Athenry in the All Ireland Semi Final at the Galway venue. 1974 Leinster Colleges Senior A Camogie Champions. Back Row L to R – Dorothy Walsh, Breda O’Brien, Geraldine Duggan, Mairead Darcy, Mgt Kelly, Sheila O’Brien, Mary Darcy, Sheila O’Brien, Maria Franklin. Front Row L to R – Geraldine Dempsey, Ann Asple, Ann Spratt, Elise Walsh (Capt), Philomena Harris, Ann Darcy, Brigid Higgins. 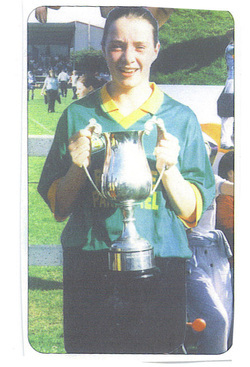 Colaíste Bríde did not again enjoy camogie success until 1992 when the Junior A team landed the Leinster title. During those lean years for Camogie Gaelic football was introduced in the mid 1980’s and the school landed its first Senior A title by winning the county schools championship in 1988. The picture shows the County Football Champions of 1988 with Sr. Ella Mc Guinness, Principal and Mr. J. Guinan (Trainer). When the Senior Football team won the first of it’s Three in a Row County Titles in 1994, the competition had become national with the county champions going on to represent their county in the All Ireland series. So it is ironic, that although having a long tradition in Camogie, it was the football team that reached the schools first All Ireland Final. Colaíste Bríde beat Bridgetown Vocational School on a score line of 5-4 to 3-8 in the County Final and advanced through Leinster with a series of good wins to meet Sacred Heart Tullamore in the Leinster Final at Dr. Cullen Park, Carlow, which they won on a score line of 7-20 to 2-2. Front Row L to R – Rose Maire Breen, Avis Nolan, Brenda Murphy, Gretta English, Catriona Leacy, Barbara Sludds, Cathy |O’Leary, Roseanne Carton. The school went on to beat Spanish Point of Clare in a hard fought All Ireland Semi Final in Ballymacarberry on a score line of 6-6 to 3-10 before taking on the might of Ballinrobe Co. Mayo who were seeking their fourth All Ireland on the trot. Colaíste Bríde’s brave bid just failed on a wet day in Tullamore loosing by just four points. 2-10 to 2-6 after pushing the champions all the way down to the wire. 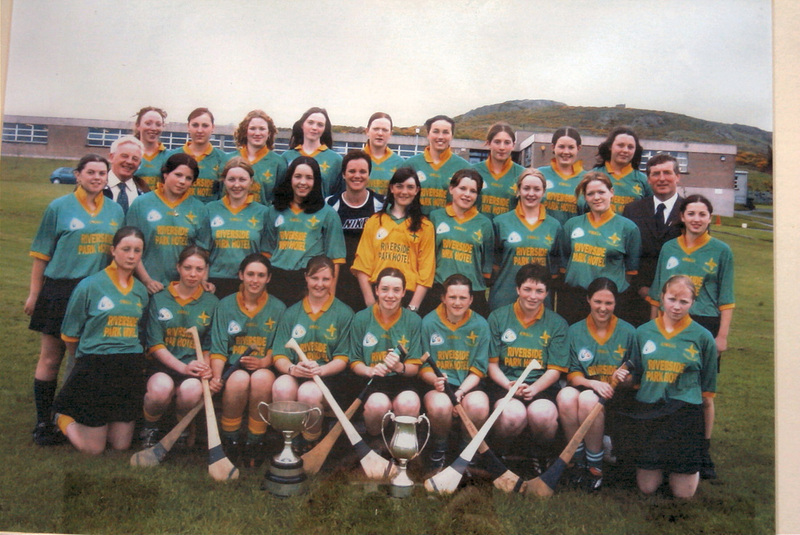 The Senior A Football team won the County title beating Loreto, Wexford 5-9 to 1-7 in the Final of 1995 and went on to retain their Leinster title by beating Coolmine of Dublin in the Leinster Final – score 5-12 to 1-2, before again giving best to Ballinrobe in the All Ireland Semi Final. Back Row L to R – Jimmy Guinan (Trainer), Aoife O’Connor, Sinead Purcell, Barbara Sludds, Claire O’Connor, Catriona Leacy, Rosemarie Breen, Noelle Murphy, Colette Butler. Middle Row L to R – Pauline Doyle, Paula Finn, Carmel Creane ,Nicola Kehoe, Catherine Guinan, Ann Marie Daly, Ruth English, Finola Furlong. Front Row L to R – Deirdre O’Rourke, Lorraine Leacy, Evelyn Kehoe, Cathy O’Leary, Brenda Murphy, Aoife Newe, Roseanne Carton. The Senior Football team won their third county title in a row in 1996 beating Bridgetown Vocational School 3-7 to 1-8 in the County Final after extra time, but were beaten by St. Leo’s of Carlow in the Leinster Final that year, 2-5 to 1-5. However, this was the start of the upsurge of Camogie again as practically the same group of players won the Leinster A Camogie title in that year. Having being beaten by Loreto Kilkenny in the Leinster Final of 1994 (5-5 to 1-6), and by Presentation Kilkenny in the Final of 1995 (3-4 to 2-4), it was third time lucky for the camogie girls by getting revenge on Presentation Kilkenny beating them by 2-14 to 3-1. St Raphael’s of Loughrea proved a step too far as they went down by 0-12 to 1-3 in Loughrea in the All Ireland Semi Final. The schools next attempt at All Ireland glory came in 1998 and 1999 when Colaíste Bríde won the Leinster A Senior final but were beaten by Charleville of Cork on each occasion. 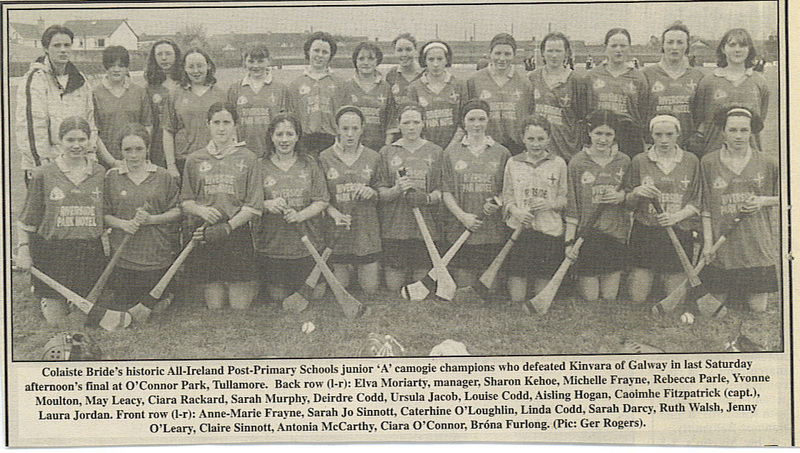 In 1998 they defeated Loreto Kilkenny in the Final in Carlow 2-10 to 1- 8. They then travelled north to play St. Patricks, Maghera, Derry in the All Ireland Semi Final where they ran out easy winners 2-12 to 1-6. However it was a different story against St. Mary’s of Charleville in the All Ireland Final where our girls were beaten by 1-11 to 1-4, Charleville making it three in a row at the Rag, Co. Tipperary. 1999 presented new challenges and the girls retained their Leinster crown beating Ballyhale Vocational School Kilkenny in a low scoring game 0-6 to 0-1. This time it was Portumna Community School Galway who provided the All Ireland Semi Final opposition at Bellefield, Enniscorthy. Colaíste Bríde proved the stronger and more experienced side and had a fine win 2-9 to 1-6 with strong local support. Back row L to R – Fiona Murphy, Sandra Murphy, Niamh O’Connor, Claire O’Connor (Capt), Sarah Russel, Helena Jacob, Gretta Heffernan. Front row L to R – Sharon Farrington, Lenny Holohan, Caoimhe Fitzpatrick, Bernie Holohan, Ursula Jacob, Grace Kelly, Jenny Codd, Catherine O’Loughlin, Bridget Carley. On the 17th April 1999 in Mc Donagh Park, Nenagh, St. Mary’s Charleville again proved too strong for the Enniscorthy girls running out 3-10 to 0-5 winners to claim their fourth consecutive All Ireland title. The first All Ireland title to come to the school was in 2000 when the Junior A Camogie team set the pace for the following years. Having disposed of Loreto Kilkenny in the Leinster Final 6-5 to 1-1 and then St. Mary’s Charleville, Cork, (the auld enemy) in the All Ireland Semi Final, after a replay in Charleville, the scene was set for the All Ireland Final in Tullamore. This team laid a marker for future glory by defeating Seamount, Kinvara, Galway by 3-5 to 0-8 and the bonfires began blazing again on Vinegar Hill. It was increasingly more difficult to keep both Gaelic Football and Camogie in the frame to win titles at the top level as roughly the same panel of players were involved in both codes. However, due to the dedication of the players the Junior football team won the Leinster title in 2001 beating Rochford Bridge of Westmeath in the final and again in 2002 beating Dunboyne of Meath in the final. Front Row L to R – Una Leacy, Ruth English, Ursula Jacob (Capt) Louise Codd, Niamh Dunne, Deirdre Codd, Brona Furlong, Deirdre Swan, Mary Leacy. Front Row L to R – Mary Leacy (Capt of Camogie Team), Sinead Breen, Deirdre Codd, Brona Furlong, Ursula Jacob (Capt of Football Team), Yvonne Walsh, Anna Murphy. Although winning Leinster in both codes at Junior Level in 2002 the senior teams learned a tough lesson in trying to juggle the big and the small ball games. The Senior Football team lost to Heywood Community School after a replay and extra time in the Leinster Semi-Final and three days later basically the same panel of players went down to Loreto, Kilkenny in the Leinster Final. 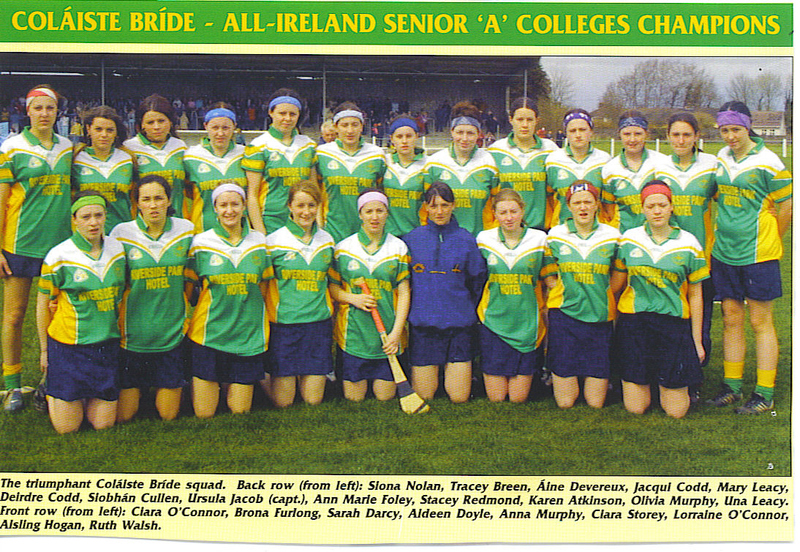 So for 2003 and following years the emphasis was put on camogie and with great results. 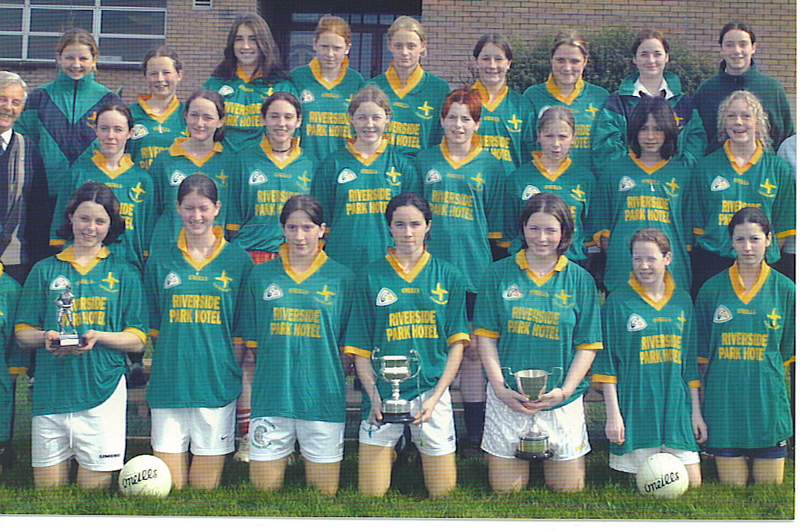 In 2003 the girls great run through Leinster saw them getting revenge on Loreto Kilkenny who had beaten them in the previous two Leinster Finals, by defeating them at Coolree by 5 -7 to 4-3. The Leinster final played in Carlow saw captain Ciara O’Connor raise the Leinster trophy amid scenes of great jubilation after defeating Presentation College Callan by a score of 4-9 to 0-2. Colaíste Bríde were now pitted against old rivals St. Mary’s of Charleville in the All Ireland Semi-Final but had home advantage at Bellefield, Enniscorthy. Urged on by the roars and screams of the home support the girls tore into the game from start to finish and ran out winners by 3 -10 to 3-4. Opposition: St. Patrick’s Maghera, Co. Derry. Result: Corn na Sceilge arrives on Vinegar Hill, Enniscorthy and to County Wexford for the first time. Centre Forward Ursula Jacob takes up the story. “With a place in the All Ireland secured, training intensified under Coach Ms. Elva Moriarty, aided by Mr. J. Guinan and Martin Storey. Attention to detail was the order of the day in the run up to the final against St. Patrick’s Maghera on Saturday, 5th April, 2003. The Derry girls were the first to score but they lead only briefly although they continued to create chances throughout the opening half. As the guardian reported “instead it was Colaíste Bríde who forged ahead as the full forward line made the most of the ball that came their way”. “Three times they found the net in the first half as Una Leacy gave her marker a horrid time, with her two goals sandwiching a third from full-forward Jacqui Codd. There were points too for Ursula Jacob who clearly revelled in the occasion and for captain Ciara O’Connor who found the target from frees and from play”. The Local newspaper continued, “The foundations for success were laid in the half-back and mid-field sector. Centre back Mary Leacy settled early nerves and her composure spread to all around her with Treacy McCormick and Stacey Redmond particularly outstanding in front of a solid full back line of Ruth Walsh, Aisling Hogan and Karen Atkinson with young Ciara Storey playing like a veteran between the posts. With Brona Furlong and Ciara O’Connor (1-4) having an edge in the centre of the field, the front runners were provided with great deliveries from which to put the Derry defence on the back foot”. The six forwards: Louise Codd, Ursula Jacob, Sarah Darcy, Anne Murphy, Una Leacy and Jacqui Codd pressured Maghera from start to finish with all displaying skill, pace and great team-work. Jenny O’Leary came on for Louise Codd and Deirdre Codd replaced Anna Murphy late in the game. Also on the panel for the historic win were: Olivia Murphy, Mary Breen, Johanna Breen, Aideen Doyle and Siona Nolan. The memories of the past defeats were erased in the wave of emotion that greeted the final whistle in Kilbeggan, and the welcome home to the Cathedral town will never be forgotten. Beginning with blazing bonfires in Scarawalsh and continuing with a cavalcade into town, which circled the bridges, and culminating with speeches of congratulations from the steps of the Riverside Park Hotel. Colaíste Bríde Senior camogie team owes a huge debt of gratitude to Ms. Elva Moriarty whom for many years coached and trained the team. She always believed that the title was within our grasp and would be ours one day. We thank her for her dedication and commitment, for her encouragement and motivation and for all the free time that she gave to coaching and preparing the team. Thanks also to Martin Storey for his help and support and a special mile buíochas to Vice Principal Mr. Jimmy Guinan who was with us every step of the way. Jimmy G. we all enjoyed great craic”. Middle Row L to R – Tracey Breen, Jimmy Guinan, Aíne Devereux, Jackie Codd, Una Leacy, Elva Moriarty (Coach), Ciara Storey, Tracy McCormick, Sarah Darcy, Ruth Walsh, Tom Sheridan, Anna Murphy. Front Row L to R – Aideen Doyle, Johanna Breen, Olivia Murphy, Karen Atkinson, Ciara O’Connor (Capt), Stacey Redmond, Ursula Jacob, Karen Murphy, Emma Moran. Colaíste Bríde, still in celebrity mood, got a sudden wake up call by being beaten by Callan by two points in their opening game. They knuckled down to train and came through to again meet Callan in the Leinster Final in Carlow which they won on a score line of Colaíste Bríde 2-13 to Callan’s 1-3. It was now off to Derry for the All Ireland Semi Final. After a good victory over St. Patrick’s Maghera – final score 5-13 to 1-4 – and a most enjoyable weekend it was time to focus on the match we all looked forward to- another tilt at Charleville in an All Ireland Final. The game played in Cashel, Co Tipperary was a hectic, close marking, low scoring affair with Charleville scoring the equalising point four minutes from the end. Colaíste Bríde mentors insisted on a Leinster Venue for the replay and so it was off to Freshford, Co Kilkenny the following Saturday. A goal from the throw in and another in the sixth minute together with the tenacity of the Enniscorthy girls never let Charleville into their stride and the cup returned to Wexford for the second year running. Final score Colaíste Bríde 4-7 St. Mary’s Charleville 1-4. 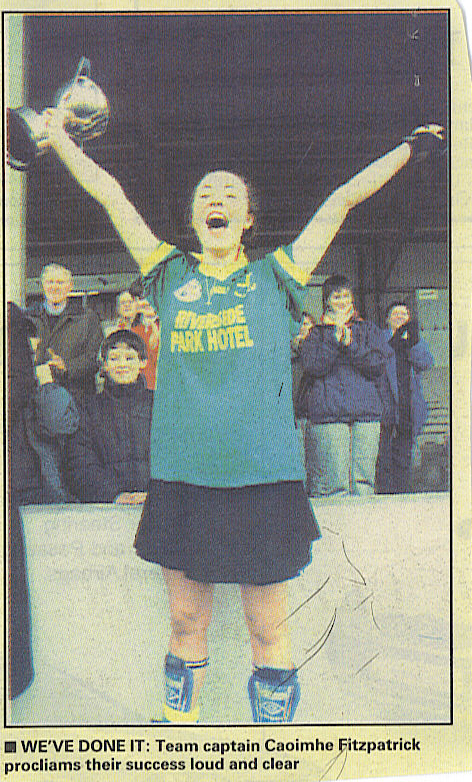 Having lost finals to Charleville in 1998 and 1999 this victory was very special for the girls and for captain Ursula Jacob in particular who played in goals in the 1999 defeat.